Gosh, the Las Vegas show was a whirlwind! I love the smaller venues for classes. 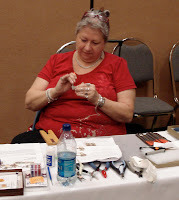 This was my first year teaching for Bead Away. Scott and Wendy Remmers from La Brea Beadworks hosted the event. 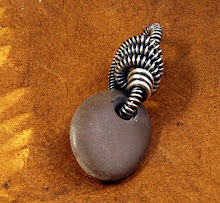 They put on a great selection of classes that included PMC, seedbeads, wire work and metalsmithing. The photo on the right is of a very talented student working away at her Breakup Ring. One of the things I love about traveling is visiting new places. Good thin this visit to Vegas was more about beads than gambling. I lost $40 on the slot machines in about a time span of about 20 minutes. Luckily, it was the last night of my stay so I needed to head back to the hotel to pack up. The big question on everyone's mind now is...where will Bead Away be held next year?